Here is the final product. 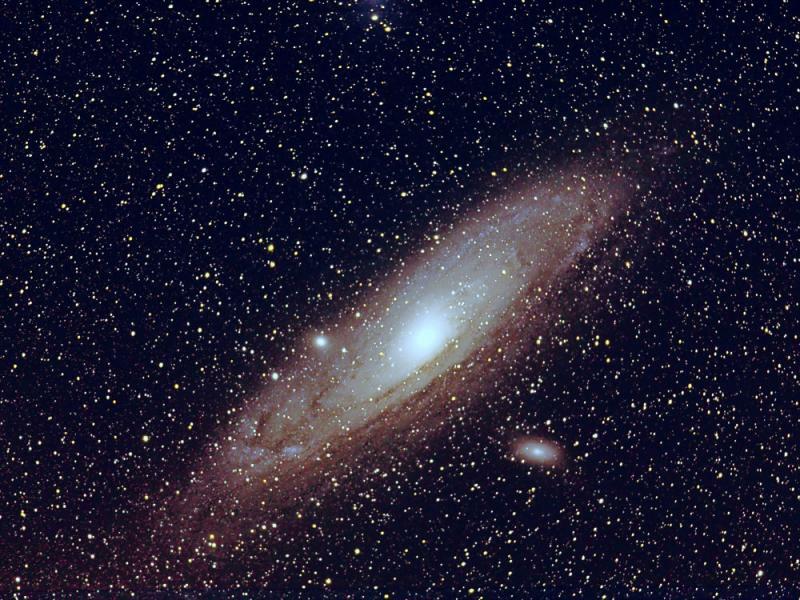 The Great Galaxy in Andromeda. Light from it started off more than 2 million years ago to reach us today. It's supposedly the furthest object visible by naked eye, at a dark site, of course. I have encountered an awful lot of problems over a long period of time in being able to autoguide in the field, away from mains power, but finally this is my first success! Dark site and autoguiding, makes for a very pleasant combination. Between a crescent Moon and clouds moving around I managed to grab 20 good frames each exposed for 5 minutes in a Canon 1Ds set at ISO 1250 using a Canon EF 600mm/4.0L IS lens, wide open at f4. I was hoping for a lot more, but 20 usable frames was the final tally, squeezed between the Moon and clouds. I had to discard 3 or 4 frames for faulty tracking, a plane passing through, etc. NB: shot with an unmodded Canon 1Ds, the original version of the 1Ds. Great image and processing Samir.